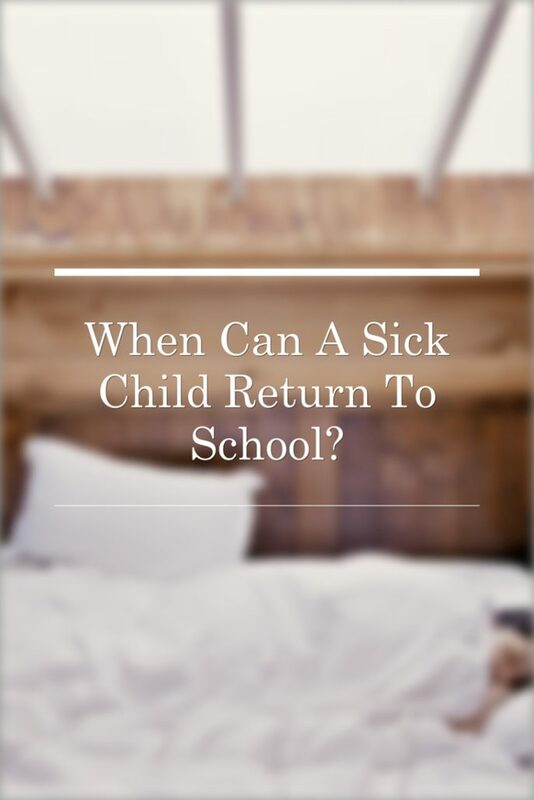 When Can A Sick Child Return to School or Daycare? Learn how to know when your child can go back to school or daycare after being sick, PLUS tips to keep your kids healthy from the start! As parents, we all want to keep our kids healthy and happy. But when it comes to the first few years in daycare and school, the “staying healthy” part isn’t so easy. In fact, we pediatricians expect that the average young child will be sick between 8 and 12 times a year. That means that if you get a nice healthy stretch of a month or two, then for the rest of the year your child might be sick once or twice a month–and that would be considered “normal.” Ouch! It doesn’t help that many of the illnesses that commonly affect young kids—from pinkeye and stomach bugs, to common colds and Hand Foot & Mouth Disease—are extremely contagious. So unfortunately, your child is practically bound to catch a few of these illnesses at least once, if not several times over the first few years in daycare and school. Of course, the big question that most parents struggle with is once your child has gotten sick, when can you send him or her back? Okay to send. For most kids, October through March will be a time of constant runny noses, with an occasional few more in spring and summer. What’s more, the average cold for a child lasts between 15 and 25 days! Your child won’t be miserable for all that time, but they might not be perfectly back to normal until a few weeks have passed. So if we kept every kid with a runny nose home from school, they’d be out of school for most of the fall and winter! After you experience the first few colds with your child, you’ll soon come to realize that as long as there is no fever and your child seems fairly comfortable, it’s okay for them to go. Learn everything there is to know about coughs, croup, wheezing, and pneumonia in this popular article. Send back when your child is fever-free for over 24 hours—and that’s fever-free on their own, not counting use of Tylenol or ibuprofen. These medications only mask the symptom for a few hours, they don’t cure the infection. Check out my thoughts on everything you need to know about fevers. If it’s bacterial, you can send your child back 24 hours after he’s started on eyedrops or ointment. If it’s viral, then there isn’t much that can be done and they can be sent back the same day (officially, kids will shed viral pinkeye for up to 3 weeks, but no one can be kept home for three weeks). How do you tell the difference between bacterial and viral pinkeye? Find out here. You can send back 24 hours after your child has stopped vomiting. It’s important to note that some children will throw up once more two or three days after it seemed like they were better. This doesn’t usually mean that they’re still sick, just that their tummies haven’t fully healed up yet. Your child’s appetite may have improved, but her stomach might not be able to handle her full, regular diet just yet. For older kids in school, it’s okay to send them if 1). they’re good about washing their hands after using the bathroom, and 2). they aren’t going so frequently that they’ll be uncomfortable in class all day. As for children in daycare or preschool, ask about the daycare/school’s policy. Many daycares will send a child home the first day he has diarrhea. This makes sense — it’s just starting, so they don’t know where things are headed. However, diarrhea from a common stomach bug can last as long as two weeks, so as long as everyone washes their hands well, diarrhea really can’t be a factor that keeps a child home for more than a day or so. Vomiting is a much stronger reason to be kept home. Learn more about taking care of a child with vomiting and/or diarrhea here. Ear infections are secondary infections, usually occurring after a common cold. You can’t pass an ear infection on to another person, but the cold that led to the ear infection might still be contagious. So, treat ear infections like the common cold—if there is a fever, stay home until 24 hours after the fever is gone; if there isn’t a fever, then it’s okay to go. If you know that your child has strep throat, then ideally you’ve already been to the doctor and have started on antibiotics. If this is the case, then your child can go back to school a full 24 hours after the first dose of the antibiotic. Before 24 hours of antibiotics have passed, your child is still considered contagious, so sending him back too soon will spread the disease. For the “secret signs” of strep throat, listen to this short podcast episode here. These are tricky, because the biggest factor is how comfortably your child can breathe. For pneumonia, like strep, your child is still considered contagious through the first 24 hours of antibiotics. But your child may not be ready to go back after that first day if she is still overly tired, has chest or belly pain, or is showing other signs of difficulty breathing. Likewise, wheezing episodes and asthma may keep your child home for a few days if she is still needing multiple breathing treatments each day, has signs of distress, or is overly tired. When it comes to pneumonia and breathing, it may be best to speak with your pediatrician to get a sense of how your child is doing and when your doc thinks she can go back to school. HFM is highly contagious and is passed in the affected child’s saliva and stool. When there is a fever, stay home until 24 hours after the fever has passed. If there isn’t a fever, then stay home until about 24 hours after your child stops either excessively drooling (from mouth sores) or complaining of mouth pain. The rash may last for a few days to a few weeks, so the key factors to think about are fever and open mouth sores. For more about Hand Foot & Mouth Disease, including how to alleviate your child’s mouth pain, visit here. If there’s a fever, it’s an infection. Allergies won’t cause fever. If the eyes and/or nose are very itchy, it’s probably allergies. If there isn’t a fever and nothing is itchy, it’s hard to tell. However, most kids won’t develop seasonal allergies until they are at least 2 or 3 years old, although it’s not impossible. So, when we’re talking about daycare, chances are that the child with runny nose and cough has a cold, not allergies. For older children, if you suspect your child has seasonal allergies, check this out for tips to help them feel better. There are many times that kids might need longer than the above timeframes in order to recover from an illness. If it’s been more than 24 hours since a fever has passed but your child is still really low-energy and not quite acting like herself, then it may be best to keep her home. Giving your child extra time to recover can help to make the illness go away faster, rather than dragging it out over weeks. Of course, wouldn’t it be nice to avoid all of these illnesses in the first place? Have your child wash his or her hands before entering the daycare or classroom, then again before you go home. This will help prevent the spread of germs to the class and back home. Starting when your child is young, have him wash his hands after every bathroom trip to establish a good habit. Make sure that your child is eating a healthy diet. Sure, this is sometimes more easily said than done, since young kids are often pretty picky. But it’s no less important—your child’s diet provides the building blocks for good health and immunity. Now, we’ve all been brought up thinking that you need a certain number of every type of food each day. But it’s not like your calcium or other nutrients reset to zero when you wake up each day. So instead, if you can at least aim for a good variety of healthy foods over the course of a week or a week and a half—and by “healthy,” I mean lots of fruits and veggies, and minimal added sugar—then you can be sure that your child is likely getting an immune system-boosting diet. When it comes to most common colds, most symptoms that we feel have to do with mucus. The ears, nose, throat, and sinuses are all connected. When mucus from the sinuses drips down the throat—which usually happens overnight—your child can develop a sore throat and a cough. If enough drips down into the belly, your child might complain of a tummyache. If it tracks back toward the ears, it can lead to an ear infection. So as soon as your child shows the first signs of a cold, you can clear out as much mucus as possible and you can help alleviate or even prevent many of your child’s symptoms. – Use saline nose spray before bed to reduce or thin out the mucus before it drips down overnight. – Have your child drink water as soon as she wakes up to wash away whatever did drip down overnight. – Use lactose-free dairy or cut dairy out while your child is sick. Lactose is known to thicken mucus, essentially keeping it and your child’s symptoms around longer. Don’t send your child to school or daycare if he or she has more than a runny nose and a cough. I know that it’s hard to arrange for childcare when your child is sick—I’m a parent and I get it. But sending sick kids to daycare and school is the number one reason why your own child gets sick there, too. 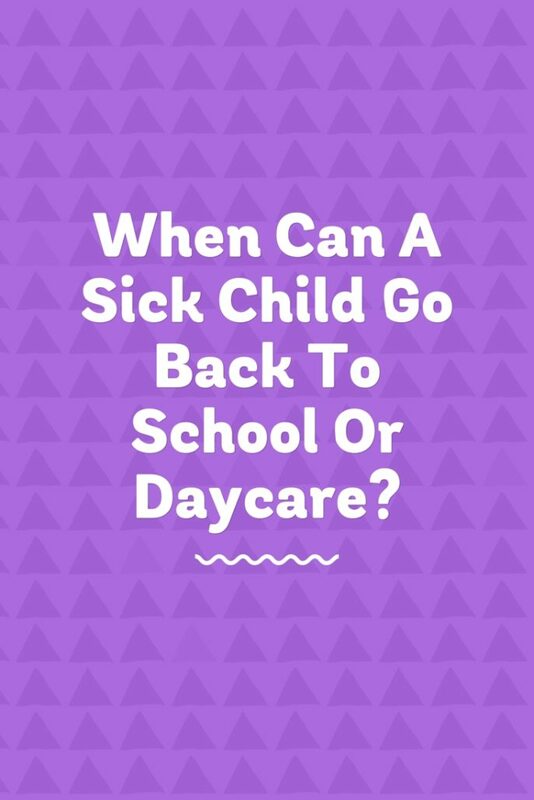 In my practice, we constantly see kids who had a fever in the morning, got a dose of Tylenol and were sent off to daycare—only to be sent home when the Tylenol wears off—and infecting everyone else at daycare in the process. Create a culture where everyone keeps their kids home when they’re sick, and you’ll find that your own child gets sick far less often. By following these guidelines—whether it’s knowing when to send your sick child back, or how to stay healthy in the first place—you can help ensure that your child and her friends at school or daycare can stay as healthy and happy as possible. Remember to SHARE this article with your friends, family, and school! For more of the best expert tips for raising happy, healthy, confident kids, visit www.drstevesilvestro.com or subscribe to The Child Repair Guide Podcast on your favorite podcast app! Thanks for this topic. We were discussing this tonight at Dinner. It was a very helpful podcast. It is good to know that my kids are OK to go to school with ear infections. I feel like we go to their pediatric doctor at least twice a month for one during cold season. I just hope it is something that they grow out of. I appreciate it when you mentioned sending the child back to school only if they have been fever free for over 24 hours and not when they are still relying on medication. I will be sure to take note of that because we are planning to take our little boy to the pediatrician soon for fever. My husband wants to know when it will be best to send the kid back to school afterward since he does not want our baby straining himself. Thank you for sharing this.